A step-by-step guide to all aspects of comic book creation--from conceptualization to early drafts to marketing and promotion--written by two of the industry's most seasoned and successful pros. Every aspiring comic book creator wants to know: what separates the beloved comics of major publishers like Marvel, DC, Valiant, and Image from all the rest? Fan-favorite comic book writers Greg Pak and Fred Van Lente reveal the secrets of comics' top talents in "Make Comics Like the Pros." The authors take readers step by step through the comics creation process from idea to finished work, and along the way offer examples and insights from their own careers as well as their collaborators'. Not only that, but Pak and Van Lente also join forces with Eisner Award-winning cartoonist Colleen Coover to produce an original comic inside the book! 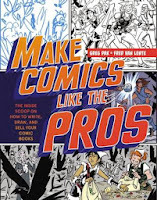 With its unprecedented level of insider access, "Make Comics Like the Pros" gives comic book hopefuls the tools they need to reach the next level of sequential arts stardom. Ever wondered just how many people it takes to make a comic book and what all of those fine folks do? This could just be the perfect book for you. It covers everything and does it in such a way that is easy to follow along and learn a lot along the way. Throughout each section, folks in the industry tell you how they do their job and do it well. As someone who has a minor role within this industry (both as an editor and reviewer), it was a delight to see the full behind the scenes make up for any comic.